Insidious whispers rake at the back of the mind, troubling our psyche. We've all had them; fleeting, often violent, thoughts of harm to others. Revenge and spite seem to be part of human nature. Thankfully, most people can dismiss these grave thoughts and move on. 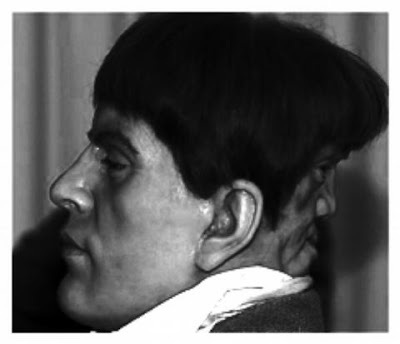 If only poor Edward Mordake could have done that. This darkness, or devil as he called it, was more than just a thought. It was a part of him; a parasitic deformity that lived on the back of his head. A face, complete with eyes and mouth. It was said to have glared and scowled. Even though it could not speak outwardly, Edward would cry out for an end to the demonic banter and hellish pestering the entity inflicted on him. In his mind, he could hear the voice, and all of the malice it brought. According to the story, he took his own life at 23 years old. This all makes for one helluva story, but certain sources call it into question. I'm certainly too much of a skeptic to believe that a demonic hell face exists, but if someone did have a parasitic twin, I wouldn't doubt that psychological trauma could result. Who knows what sort of judgment and self loathing Edward must have been going through. It is unfortunate that there isn't more known about this poor man. Stories of this nature always susceptible to aggrandizing. An affliction as terrible as parasitic twins can quickly fall into legend, and the facts distorted. This week's Freaky Friday post will detail human fascination and horror at body deformation, as well as some of the tropes that exist from it. If you have any suggestions for this post, hit up the comments section and we'll chat about it. I can't imagine what that would do to anyone, surely screws up your head. Isn't it amazing how many human conditions that are utterly out of this world? I have read a ton of King, but never checked out "The Other Half." I probably should. I don't think you could have a healthy mental state with a deformity like this. Even if it couldn't move, it would just be such a huge damper on your life. I think you'll like The Other Half, it right down your alley. :-) In fact I insist you read it! :-) I'm gonna check my big box of forgotten books and see if I have a copy for you. Greetings.